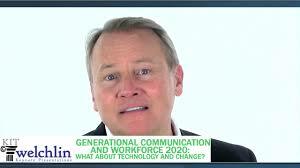 Generation 2020: What About Technology & Change? It seems like technology isn’t slowing down. Changes are occurring daily. It’s hard enough to keep up let alone lead. Multi-tasking is difficult and exhausting. What’s the deal with all of this technology and change? Yesterday, change was approached with reluctance and caution. Tomorrow, change will be expected, welcomed, and embraced. And multitasking will be the new norm, with workers using several devices simultaneously. Yesterday, innovation was a process of research and development and trial and error. Tomorrow, innovation will be more agile and be based on iteration, testing, and reiteration. The younger generations grew up as digital natives and will be very comfortable and confident using the technologies of tomorrow. Even how people approach work and work conditions will be different. Yesterday, the standards and policies for employees was one size fits all. Tomorrow, there will be a customization of everything. And there will be more boomerang employees, those leaving an organization only to return to work there, again, later. Awkward. For more information about Kit Welchlin click here.